The giant All Blacks wing was rugby's first global star. He burst on the scene at the 1995 World Cup with some of the most destructive performances the rugby world had ever seen and with professionalism in its infancy Lomu became rugby's first millionaire. Lomu, New Zealand born to Tongan parents, came to fame from a humble beginning. He grew up in Mangere, south Auckland, one of the poorer suburbs of Auckland. Lomu played rugby league until his was 14 and at Wesley College he switched to rugby. He was considered a loose forward because of his height (1.96m - 6"5') and weight (119kg - 273 pounds) but his speed (10.8 seconds for 100m) meant that he would move into the backs early in his representative career. He began his career in the New Zealand sevens team and became the youngest All Black aged 19 and 45 days when he made his Test debut against France in 1994. The world had their introduction to the towering strength and unrelenting power in South Africa the following year. The image of the man in black trampling over Mike Catt on his way to scoring one of his four tries against England in the World Cup remains a visual statement of Lomu's extraordinary talent. After the game, England captain Will Carling said: "He is a freak, and the sooner he goes away the better". He scored seven tries during the tournament and added a further eight in the 1999 World Cup, becoming the top tryscorer. In all Lomu scored 37 tries in his 63 Tests. There is little doubt that he could have scored more if he hadn't been struck down by a debilitating kidney disorder called nephrotic syndrome. His health problems first came to light in 1996 and energy-sapping condition as well as injury meant that he missed the Tests against the Springboks on historic tour of South Africa. His kidney condition was confirmed the following year and while he sat out most of the 1997 domestic season he returned for the All Blacks end-of-year tour to Wales, England and Ireland. In 1998 he helped the New Zealand sevens team win the gold medal at the Commonwealth Games in Kuala Lumpur but it was clear to many that Lomu was a shade of his former self. He returned to put in strong performances for the All Blacks at the 1999 World Cup and was arguably as formidable as he was in 1995. He scored twice in the semi-final against France and was one of the few to emerge from that disastrous game with his reputation intact. 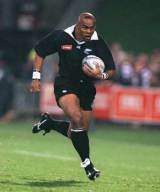 Although he remained in All Blacks squads until 2002, the magic had gone as other talents such as Tana Umaga and Doug Howlett came to the fore and illness continued to trouble the great wing. In 2003 Lomu dropped out of the Super 12 early and made a brave attempt to resume first-class rugby in the NPC for Wellington but it was evident that his health was failing and his career was coming to a premature end. Lomu amassed 185 first class games in which he scored 122 tries. He had 73 games in all for the All Blacks of which 63 were Tests. A kidney transplant in 2004 gave Lomu's career a new lease of life but despite his insistences that he could raise to the heights of All Blacks rugby again, the game had moved on. In June 2005 he lead an invitational XV in Martin Johnson's testimonial and scored two tries in the first half. But he injured a shoulder and his hopes of returning to the NPC for North Harbour were shattered when it was revealed that he would need surgery on the injured shoulder. Lomu moved to Wales at the end of 2005 on a short-term contract with Cardiff Blues. He was a crowd-puller and scored against Newport Gwent Dragons in front of delighted home fans. But a broken ankle ended his time with Cardiff early. He subsequently attempted another comeback with Marseille Vitrolles, whom he joined in 2009, but to no great success. Lomu has been recognised by the IRB as one of the greats of the game. In 2003 he received a Special Merit Award at the International Rugby Players Association's awards. IRPA gave Lomu the rare honour - only two players, Jason Leonard and John Eales, have previously received it - for his contribution to the international game. Despite a career sadly cut short by illness, Lomu remains one of the most recognisable players in the world and his performance in the 1995 World Cup semi-final is still a favourite with fans on YouTube. Fans laughed at the anecdotes of Eric Rush at the Public Memorial for Jonah Lomu. Students from Wesley College, Jonah Lomu's former school, listen to speakers at the Public Memorial for Jonah Lomu.